Welcome to the world premiere of a minor motion picture about a button lovin’ raccoon and his creator - me - Judy Schachner. 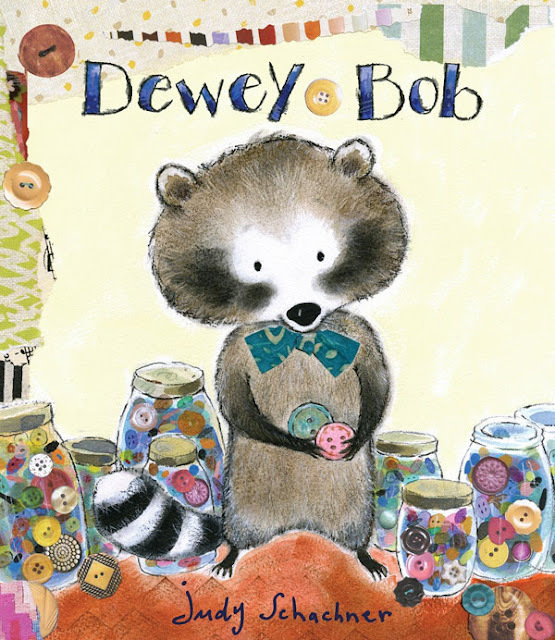 Thanks Mr. Schu, for the debut of DEWEY BOB. 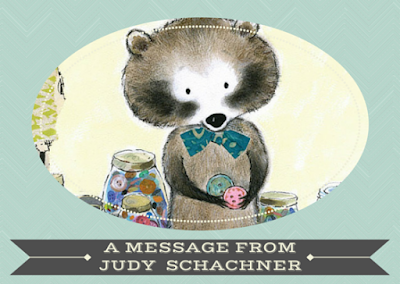 Combining art and heart with storytelling genius and a lilting twang, Judy Schachner’s tale of unexpected friendship will delight readers young and old. Borrow Dewey Bob from your school or public library after September 8, 2015. Whenever possible, please support independent bookshops. Very cute cover and trailer! Thanks for bringing Dewey to life. People are going to find Dewey Bob's compulsions and character irresistible. I had the honor of seeing Judy's illustrations for this one in progress, and they're fantastic: spontaneous-feeling, colorful and bursting with heart. Can't wait to own this one! What a wonderful glimpse into Judy's creative world! Can't wait for Dewey Bob! Wow...September 8 cannot come soon enough to bring Dewey into the world! I'm already in love with Dewey! Thanks for letting us in on your creative process. Your work is beautiful!